March is here and it’s time to get your robot on. March is finally here and NCAA college basketball is not the only game in town. Yes, it’s time for the MARCH of ROBOTS!, sponsored by Wacom and Graphixly, a fun sketch challenge created by DaCosta Bayley of Chocolate Soop studio in Vancouver, Canada. 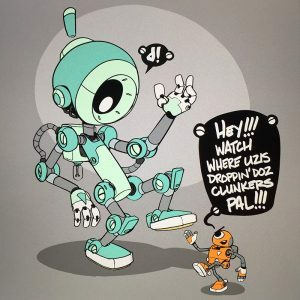 First started in October of 2012 and called #Botober, the original goal of DaCosta was to share his love of robots with the world and challenge his own robot illustration skills. “I have always possessed a positive vision of the future and the roll technology will play,” says DaCosta. “Robots are the one element of genre that have made the jump from science fiction to science fact.” DaCosta did not realize at the time the amount of people around the world that shared his passion for robots. He is humbled by the response and never expected so many to join all the fun. 2013 brought a ton of new online drawing challenges all trying to build a “somethingTober” so DaCosta decided to vacate the month of October and set his sights on the month of March. In 2014 MARCH of ROBOTS! officially became a thing. With a strong desire to explore, express and share his ideas with other robot enthusiasts, Instagram seemed like a natural fit and great platform for MARCH of ROBOTS! Illustrators wanting to jump into the drawing challenge should hashtag their submissions “#MARCHOFROBOTS” or “#MARCHOFROBOTS2019” on Instagram. One winner will be selected randomly each week during the month of March and receive a Wacom Intuos Pro Medium tablet and a full version of Clip Studio Paint creative software from Graphixly. Click here for the official MARCH of ROBOTS! rules and drawing prompt list. Working under the studio name, Chocolate Soop®, DaCosta Bayley is a self-taught designer/illustrator, living in Vancouver, Canada. He has been creating professionally since 1995 and has produced designs across various media including toys and animation.